The Rhodesian Ridgeback (also known as the ‘African Lion Dog’, ‘African Lion Hound’, and ‘Van Rooyen's Lion Dog’ for its capacity to harass lions) was bred in Zimbabwe (formerly Rhodesia) and is named for the distinctive ‘ridge’ on its back, which is formed by hairs running in the opposite direction to the rest of its coat. European settlers of Rhodesia in the 1700’s found a domesticated dog with such a ridge among the native Khoisan tribe. They adapted the Rhodesian Ridgeback to the purpose of hunting lions and other large game, probably by crossing it with large breeds that came with them such as the Bloodhound, Greyhound, and Great Dane. The resulting breed could run at great speeds, withstand harsh weather conditions, and hunt by sight or scent. Groups of two Rhodesian Ridgebacks were sent out to corner, taunt, and confuse a lion while the hunter stepped in for the kill. The first breed standard for the Rhodesian Ridgeback, based on the Dalmatian, was drawn up in 1924, and American Kennel Club recognition followed in 1955. Today, the Rhodesian Ridgeback is a popular show dog, companion, and hunter. The Rhodesian Ridgeback has a shoulder height of 61-69 cm (24-28 in) and weighs 32-36 kg (70-85 lbs). It has round eyes, a flat, broad skull, highly set ears, and pronounced stop (point at which the muzzle meets the forehead). Rhodesian Ridgebacks have small feet and a strong tail which is slightly curved upwards. They should have a black nose and dark eyes or liver nose and amber eyes. 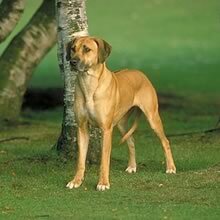 The Rhodesian Ridgeback has a short, thick, glossy coat of light or red wheaten (pale yellow-brown) with a dark mask. Some standards permit white markings. The Rhodesian Ridgeback’s distinguishing feature is the ridge running along its spine composed of hair pointing in the opposition direction of the rest of its coat. The Rhodesian Ridgeback is loyal, intelligent and straightforward. Rhodesian Ridgebacks are independent, brave, and cautious around strangers. The Rhodesian Ridgeback is highly territorial and can be aggressive if not properly trained. The Rhodesian Ridgeback is loyal, intelligent and straightforward. Rhodesian Ridgebacks are independent, brave, and cautious around strangers. The Rhodesian Ridgeback is highly territorial and can be aggressive if not properly trained. The Rhodesian Ridgeback should be socialized with cats and other dogs when young to prevent later problems. Rhodesian Ridgebacks are kind with children but will not tolerate mistreatment, so they should be supervised around young children. You can find Rhodesian Ridgeback puppies priced from $300 USD to $10000 USD with one of our credible breeders. Browse through our breeder's listings and find your perfect puppy at the perfect price. The Rhodesian Ridgeback should be socialized with cats and other dogs when young to prevent later problems. Rhodesian Ridgebacks are kind with children but will not tolerate mistreatment, so they should be supervised around young children. The Rhodesian Ridgeback should be brushed periodically to remove dead hairs, more often when shedding. The Rhodesian Ridgeback has a lifespan of 9-11 years, though some live up to 15. Like other large breeds, it is susceptible to elbow and hip dysplasia. Other potential problems for Rhodesian Ridgebacks are cataracts, cancer, and Dermoid sinus, a fatal skin condition associated with the ‘Ridge’ which should be screened for by your breeder. The Rhodesian Ridgeback is somewhat stubborn, so a consistent approach to training is required. However, Rhodesian Ridgebacks have a sensitive nature belied by their commanding appearance, so harsh training methods are not recommended and are likely to backfire. The Rhodesian Ridgeback’s tremendous stamina makes its exercise needs rather substantial. Regular long walks are required, as well as other outdoor activities where it can burn off energy. Rhodesian Ridgeback Puppies for Sale - Shipped Worldwide! Finding the right Rhodesian Ridgeback puppy can be dog gone hard work. PuppyFind® provides a convenient and efficient means of selecting and purchasing the perfect Rhodesian Ridgeback puppy (or Rhodesian Ridgeback puppies) from the comfort of your home, 24 hours a day, 7 days a week. Take advantage of our PuppySearch or leisurely browse our directory of hundreds of dog breeds, Rhodesian Ridgeback dog breeders, Rhodesian Ridgeback dogs for adoption, and Rhodesian Ridgeback puppy for sale listings with photos and detailed descriptions. Some Rhodesian Ridgeback puppies for sale may be shipped Worldwide and include crate and veterinarian checkup. Many Rhodesian Ridgeback dog breeders with puppies for sale also offer a health guarantee. With thousands of Rhodesian Ridgeback puppies for sale and hundreds of Rhodesian Ridgeback dog breeders, you're sure to find the perfect Rhodesian Ridgeback puppy.